At the offical start of the walk on Eastbourne’s outskirts, we were waved off by Matthew’s grandparents. Many walkers start at the town pier, but this would have added two miles along the prom. The day started very misty and the two lighthouses of Beachy Head and Belle Tout loomed out to us. I even needed to take a reassurance bearing away from Belle Tout! But the sun broke through on the mile inland to East Dean – a diversion with two good reasons: we needed the bus back, and there is a super pub on the village green, where we took a coke (Matthew is 7) and a pint (Peter is 45) in blazing sunshine. 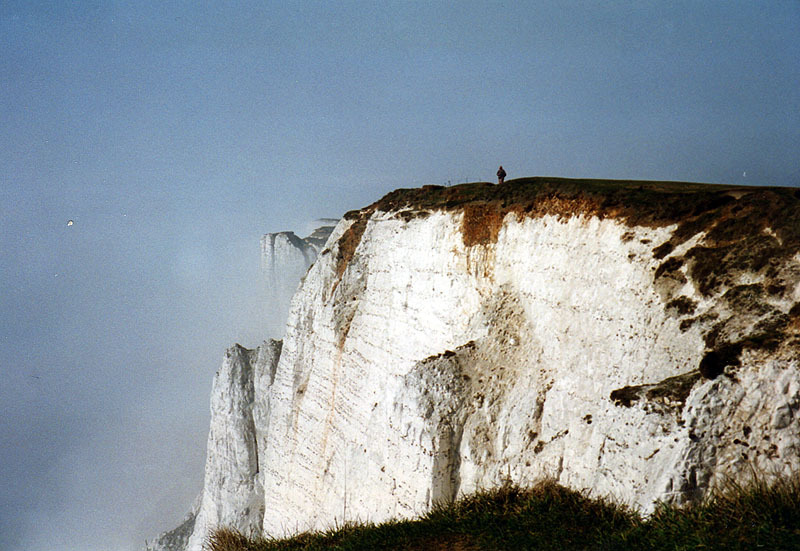 This is one of the most famous walks in southern England, across the chalk cliffs called the Seven Sisters. Whether far out to sea or inland through the denes, there is always interest in the views, and firm grass forever underfoot. There was a visitor centre at Exceat Bridge which included a live insect collection that Matthew enjoyed. We were given a lift to Birling Gap to start, and then bus from Exceat, which is on the main A27 road. We made this short stroll into a family day out, with Matthew’s mother, brother and grandmother – three generations! Although short it’s quite hilly for little ones. It goes through Friston Forest, the first stretch of woodland on the Way – there is very little more until Amberley is reached. Matthew, now 8, took some convincing that he could walk this far! Alfriston is a useful walkers’ stop in the Cuckmere valley, one of the main villages on route. We spent half an hour on a picnic lunch at Firle Beacon. There is a little station at Southease, from where we took the train back to the grandparents at Hove. 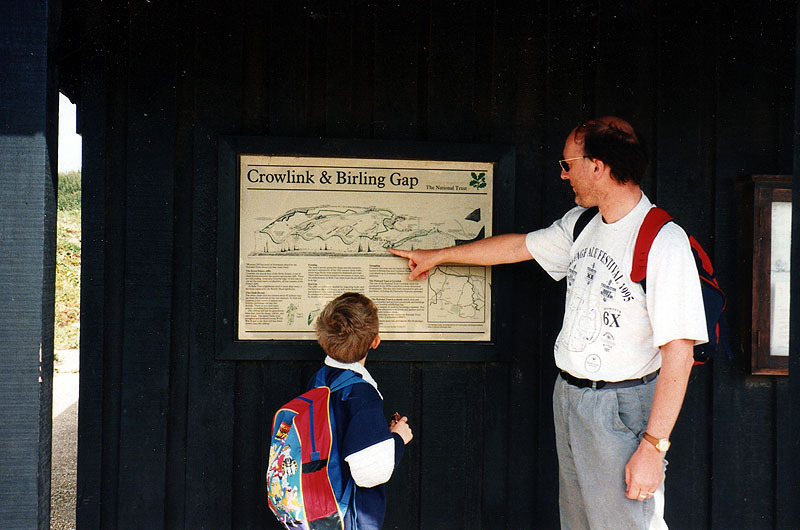 Matthew, who had reached 9, had been studying river features at school (and some years later, went on to study A-level geography), and the River Ouse at the start showed off plenty of them. There were tiny spiders in the hedges on the hill above Rodmell, whose webs span out in the breeze across the track. When we stopped to pause at the top, the flap of my rucksack was full of the creatures. Very spooky. This section ends at the Newmarket Inn on the main A27 road; it was later de-pubbed into a fast food location, but has since bucked the pub closure trend and re-opened. Not a difficult stretch, although almost all uphill, but we took it very easily. Barbara met us at the car park at the Beacon, otherwise it’s a steep downhill walk to public transport. This was a hot day. We spend time exploring the ‘Jack and Jill’ windmills at Clayton and enjoyed cool lemonade in a cafe on the Way at Pyecombe before tackling the stiff climb up to Devil’s Dyke. Matthew, aged 9 now, did find this hard going so we took plenty of breaks. It would probably have been better to do it on a cooler day. There was the promise of ice cream and a pub lunch at the Dyke hotel though, and we finished off the day with an open-top bus ride along the Dyke road to his grandparents’ house. Matthew, now 10, for the first time genuinely found the walking well within his physical capabilities. Helped, no doubt, by a broad and easy stage, which when not level or slowly rising is inclining significantly downhill to the floodplain of the Adur where it finishes. It had nagged me, over the years: had I (we) completed the South Downs Way, or not? We had chosen to walk out from Eastbourne along the cliffs, like virtually everyone else; but the SDW has an alternative, inland. The two routes are complementary. Other than the cliff section, the SDW is on bridleways, and so is bike- and horse-friendly, and hence the inland route is the only alternative for riders using those means of transport. So that I could claim my SDW completion with clear conscience, I decided to go back and walk it many years later. It’s a grand route, much quieter, heading quickly north onto the Downs and then turning in a quarter-circle slowly west. The route comes down from the hills once, to the village of Jevington, which has a super pub that was very welcome on a warm and close day. Beyond, the SDW crosses Windover Hill, with Deep Dean, a superb example of a dry Downs ‘hanger’, to the south. Alfriston is then entered by the Cuckmere valley, rejoining the cliff route. The village has few buses, and none convenient to me, so to reach transport home I walked the five miles to Berwick station. It’s fine, if a little unexciting, to Berwick church, but thereafter the A27 has to be crossed, sunflower fields obstructed the path, and the route beyond them is none too clear. Just as well I had no need to rush.